I took this photo of Lightning while we walked together during a keenly cold morning. A brisk winter wind was blowing across his coat. He placed his elegant gaze on me from beneath a large fir tree. His world was simple and primal. This haunting photograph is titled “Shadow Fan”. It won the Top Professional Award at the 2009 SCA National Specialty. 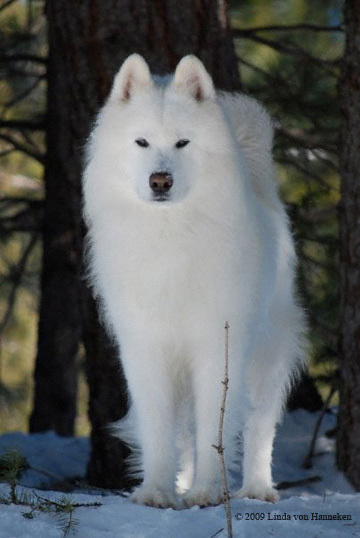 Our image graces the Samoyed Club of America’s website, exemplifying the working heritage, power, and joy of this nobel breed. During the winter season of 2008-2009, we once again borrowed Lightning’s sister Moonrise and half-sister Canyon. These girls ran on our team two years prior when we were racing and won the Top Sprint Racing Award from the Samoyed Club of America. We also got to puppy-sit Moxie, one of Lightning’s sons, for a few weeks, which gave us six dogs to play with. We hooked them all up to the sled on a fan-hitch, an arrangement which allows all the dogs to run side-by-side instead of in pairs on a long gangline (as is traditional for our part of the world). From left to right: Lightning, Stormy, Moonrise, Nimbus, Canyon, and Moxie. 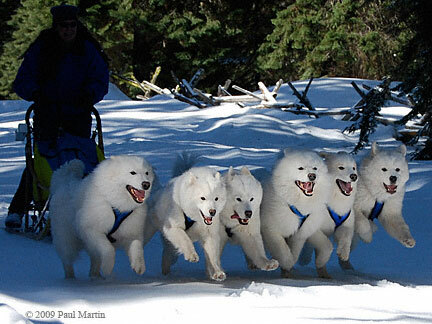 The ages of the dogs on this team range from six months to nine years. Moonrise and Canyon belong to Kay Hallberg of Wolf River Samoyeds, the breeder of our dogs. Moxie belongs to Amanda & Michael Berkeley. Lightning's sister Moonrise (BISS Ch Wolf River's Moonrise WS) and half-sister Canyon (Seamist Canyon Of Wolf River WS) visited us during the winter 2008-2009 sledding season. 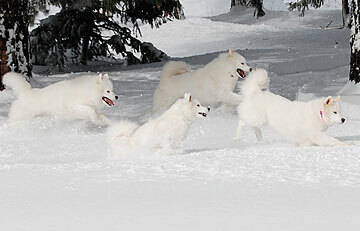 They got to do a lot of free-running in the deep snow together. Canyon is leading followed by Lightning, Stormy, and Nimbus. At nine years old, Lightning still plays like a yearling in deep snow.